I did not get motion sickness when I demoed Sony's new and improved Project Morpheus VR headset at GDC this week in San Francisco. And that's saying a lot considering my sweaty outcome at a private E3 demo last year. But I did get somewhat hurt while using it. Blame it on the shark. I banged my head into a wall while whimpering and trying to avoid the jaws of a menacing virtual version of, well, Jaws. It's proof that compelling VR is powerful; powerful enough to send you slamming into nearby walls with a smile plastered on your face. It's to Sony's credit that the shark in The Deep, one of three new Morpheus demos, never actually directly attacks the user. It would simply be too intense, although Sony apparently considered it. 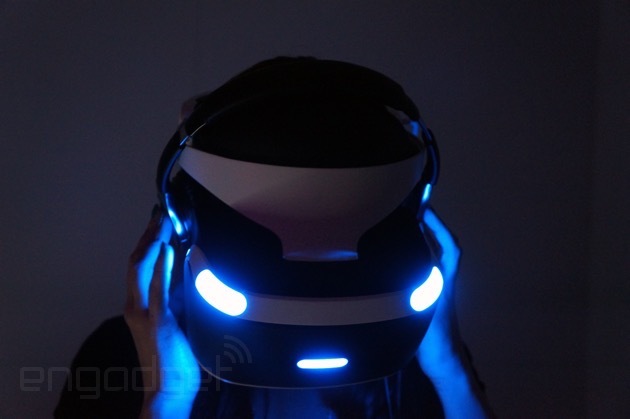 "You must be very cautious," says Javier Fernandez Sr., technical project manager for Morpheus. "You don't want something to suddenly happen and then you go out of [view of the] camera or something, and also make people dizzy or sick. You're so immersed in that world that having the shark coming at you full throttle, you might cause someone to trip over. And safety is first. So there's a lot of things you need to consider before you make it that way." The programming kinks, hardware and VR standards to simulate "presence," it seems, have mostly been ironed out by the Morpheus Research and Development team. Issues like the low-res "screen door effect" and motion blur have been greatly reduced due to the headset's new 1,920 x RGB x 1,080 display and 120Hz refresh rate. Which is partly why Sony was able to commit to a consumer launch window of early 2016. "We've been wanting to commit to a launch window," says Richard Marks, senior director of R&D. "We just felt like we have to deliver a certain level of experience before we call it a product. You know, the first time you try VR is the most important time. And if we were to create an experience that's not good enough, it would turn people off." "There are definitely lessons we've been learning about that side of things, the experience side. How you move people through a world. And a lot of it's counterintuitive," says Marks. The consumer end goal may be in sight for Morpheus, but for Marks and his team, there's still a lot left to learn about crafting experiences in VR. "There are definitely lessons we've been learning about that side of things, the experience side. How you move people through a world. And a lot of it's counterintuitive. People think that, 'Oh, you should kind of ramp up [the experience] slowly and get faster and faster.' And that's actually the easiest way to make you sick. If you do things that are discontinuous, that are not things that happen in the real world, you don't get sick; you just get startled by it usually. And that's surprising that it doesn't. You'd think, 'Oh, teleporting might make somebody sick.' But you know, you never teleport in the real world, so you don't have any kind of feeling that that's the wrong way to teleport. So it feels perfect when you teleport. It's disorienting and then you're somewhere else. So you can do things that might not seem intuitive." Marks says the initial batch of Morpheus launch games will feature a combination of standing, seated and leaning experiences, though he wouldn't say how many to expect. He also wouldn't comment on just what would be bundled in the final retail Morpheus box, but did say that it's likely users could see a collection of Morpheus demos packaged together as an intro to VR. 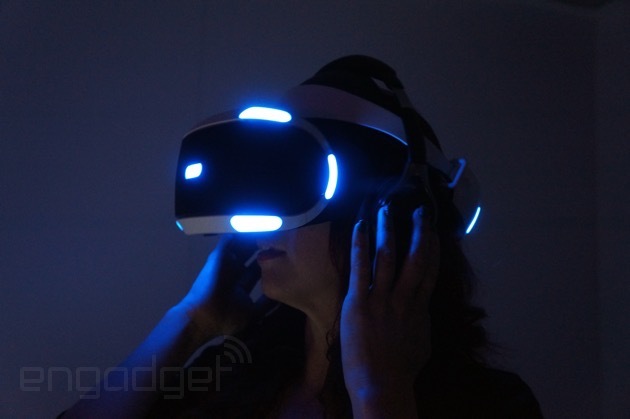 Those hand-holding VR experiences could even come from select Morpheus partners. "We've worked with NASA," says Marks. "Just giving a high-quality look around at something space-related as something free that comes when you get the system, it's already available to you. I think that would be a great thing to do." The other reason for that semi-solid launch date has to do with reputation and partner involvement. Though there is no real PR race between Oculus VR and Sony PlayStation, the former has gained a significant share of headlines and industry clout for its openness with the platform (see: Samsung's Gear VR). Of the many artists and filmmakers I spoke to at this year's Sundance Film Festival, only one could actually say she'd been approached by the Morpheus team and that was immersive journalist Nonny de la Peña. Marks says there's an easy explanation for this, though. "We actually do have a lot of non-game-related contacts out there," says Marks. "I mean we have our own picture studio, so we're talking to them and we're talking to a lot of Hollywood studios. I think the big thing that's been different is there's no way for these people to think about how they can deploy something. Or, there hasn't been because we don't provide developer kits to people from those industries that they can then productize themselves. So they didn't really have a path before. There was no consumer product before." All of which is to say a flood of high-profile partner announcements should be incoming sometime soon, especially from "promotional industries." Marks says that Sony's been talking a lot with the auto industry and that they've been working on experiences "to give you a feel of sitting there in the car." "We've worked with NASA," says Marks. "Just giving a high-quality look around at something space-related as something free when you get the system. I think that would be a great thing to do." One thing users can definitely count on, however, is a commitment to the gaming side of things from PlayStation and Morpheus. Sony may be considering a Hollywood venture akin to what the Pixar-like Oculus Story Studio is doing, but you won't see it come from the PlayStation side. "Our focus in PlayStation is more on interactivity. But I think VR is an interesting place to tell stories as well. It's just not exactly our major focus. Our major focus is on the gaming side where you actually are interacting with what's happening. Not just looking, but doing something," Marks says. It may be big business, but Marks maintains the VR development community is still very much open and collaborative, even across separate companies. And the Morpheus team still views Oculus as a great ally helping to pioneer consumer-grade VR. "They're still a good partner in the industry, I think, to have," he says. "On the engineering side, we kind of compete and try to make our specs better than their specs and things. But on the business side, we both want to achieve the same thing. We want good VR to be out there. We want the market to grow. In some ways, we're on a separate platform. We're about the PlayStation 4, so it's not even like our market competes with them." Don't miss out on all the latest from GDC 2015! Follow along at our events page right here.